While double parking is a common sight in Malaysia, we are glad it is not a common practice in Singapore. 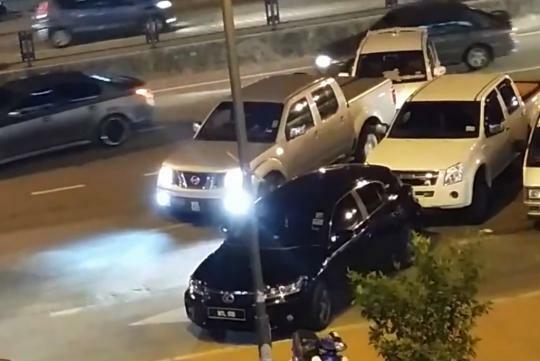 Watch this Nissan Navara driver take matters into his own hands as he gets sick of waiting for the Perodua Myvi's owner to get his car out of the way. With at least 356Nm of twisting force and a towing capacity of 3 tonnes, it easily pushes the poor little hatchback out of its way and leaves it in the middle of the road. The full-time score? Nissan Navara 1, Perodua Myvi 0. That is damn dangerous la but I do not know what else can be done other than to wait for the dumbass driver to come back. While I do not condone the actions of the Navara driver as it endangered the rest of the road users, and also caused unnecessary buildup of traffic, I can empathize with his frustrations. Would applaud his actions if he did not have to push the Perodua into heavy traffic. Well, Malaysia Boleh! Enough said. The tires of the Navara not very good. You can see the rear wheels spinning as it struggles to push out the Myvi. I won't be surprised if the Myvi driver is a lady. Female drivers tend to be oblivious to their surroundings be it while driving or parking. It's just a little Perodua Myvi. Should've picked it up and thrown it into a longkang instead of endangering traffic. The truck driver also one kind... he can't even see oncoming traffic bt he is just pushing the Myvi out.... two wrongs dun make a right loh.